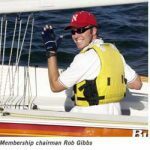 Rob Gibbs will conduct a powerboat training class on two days in May. The classroom portion is Thursday, May 16 from 5:30 to 9:30 pm at the Tempe Police Department, Apache Substation. The on-the-water portion will be on Sunday, May 19, from 8am to 1pm at Lake Pleasant. The course is offered by the Arizona Sailing Foundation (ASF) as a courtesy to AYC members—for no charge. Since we need additional certified boat drivers for AYC events, if you’re not a member, you may take the course for just $50 if you intend to help on race committee.